Most bike shops in Australia are independent retailers operating as sole traders, and even the ones who are dealers for major brands like Specialized are still one-off local retail outlets. A few chains are starting to emerge like 99Bikes but the market in Australia remains fragmented and ‘local’. These small business operators are realistic enough to understand the online marketplace but there’s a number of reasons why you should continue to support them even if you do some of your purchasing online. Put simply, if everyone did all their purchasing online, then local bike shops would make no money and most of them would close. If you then decided you weren’t able to fix your own bike or find that elusive spare part, there would be no local bike shop to help you out. You’d find you would be travelling miles and lining up with the masses to get your bike repaired. While some people are great at fixing and servicing their own bikes, the majority of us are either not capable, or don’t have the time to do it ourselves. So even if you buy all your cycling products online you’ll still need to visit your local bike shop on a regular basis to get your bike serviced. Bikes are just like cars in that they need regularly servicing because parts wear-out and fail, and the bike stops functioning correctly. Over time the chain on your bike will stretch, and in turn it will wear down the teeth on your cassette and chain rings. If you change the chain regularly you’ll decrease the wear on the other parts. Brakes also need regularly attention, particularly disc brakes which are becoming more and more common on mountain and road bikes. This is the sort of advise you will only get from a bike shop, not from an Internet forum where you will learn all sorts of contradictory information. Local bike shops are a great way to meet other like-minded cyclists. You’ll find the owners and staff are usually keen riders themselves and happy to invite you along on their regular shop rides. If the first bike shop you visit doesn’t cater for your style of riding then find one that does. There’s no reason why you have to frequent the bike shop that is geographically closest to your home. 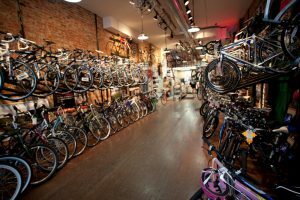 There are some bicycle product wholesalers who support bricks and mortar retailers and don’t allow their products to be sold online. You’ll find this with Specialized products in Australia where you can only buy Specialized bikes and accessories for authorised dealers. If you want to see a product or try it on before you make a purchase, then you need to visit a physical store. Of course you can order an items online and if you don’t’ like it you can return it but it can be a huge hassle particularly if the item is a bike or another large item and you bought it from overseas. Share you experience of your local bike shop, both good and bad. Nice article. We had been thinking of penning something similar! Peter, you’ve obviously had some ordinary experiences with bike shops but not all of them are the same. Shop around until you find one that suits your needs. Wow, thats the worst write up I have ever seen. Most bike shops I know don’t run their business like that at all. These days most retailers are trying to get the best product they can at the best price for the consumer. Plus offer the best service they can as that is their biggest asset v’s online. Maybe you are in bad area or you could look around a little more. Move to Geelong mate in the group I’m in we have had some terrible experiences you think you’ve won the lotto if you can get them to ring you back. I’m with Peter on this one. Local shops with dreadful customer service are becoming more regular. I understand they are trying to run a business but myself like a lot of other people are trying to support a family. Why spend $100 in a shop for something delivered to your door for $48 !!!!! Not everyone can walk into a bike shop and buy top range equipment, even worse is when the after sales service is a continued letdown. Find a good mechanic that works from home, buy mechanical goods online and if time permits, spend some time on youtube looking at videos on basic bike servicing, it is a lot easier than it looks. I am a keen cyclist for both MTB and road, I agree the key to a good bike shop is a good mechanic, and I will always support a shop that has one, as yes we can all buy parts online, but that won’t get your bike fixed and setup correctly, so I am happy to pay that bit extra on parts to support the good mechanic. I disagree Peter , I have been riding and racing in melbourne for over 30 years and found that the people in local bike shops are extremely knowledgable and helpful, it always makes more sense to buy from your shop and receive the back up service needed then buy on line and get stuck with a incorrect or ill fitting item. I am a retailer of a Specialized concept store in Melbourne..
As a retailer I accept and support that some of our customers buy online, we also shop online for some items. The retail landscape in some countries is that shops do not carry many if any really good parts (obove 105 level). There is also not enough business to pay, train and keep great staff who can deliver a shopping experience that we all increasingly expect in store, a level of service that generally is not required online. Online sellers do not need to be well presented, polite, knowledgable or even at work on time, we work weekends for your convenience. I invest heavily in workshop staff, training fitting professionals and setting up our store for a great experience, we strive to deliver what you can’t buy online. I hope customers compare and hopefully pay close to online pricing in store and be happy to pay a bit for an industry professional for their experience to ensure you enjoy cycling more. With your business, we will be able to continue to invest in being what you expect and perhaps need in the future. Disclaimer; for those who have ever had a bad shopping experience at a local store, it may have been an individual person and does not necessarily reflect the experience of all staff, if you can find somebody in a local store that knows their stuff and cares about you which is about 30% of the retail bike industry, value them and build a relationship. what is funny about all online discussions is that 90% of the time its bad reports and 10% good. it’s the same with retailers, great service is not really ever reported however crap service is uploaded almost immediately. I like to think that if you do your utmost to give the client what they need instead of what you have in stock, then they will always come back in the future. Way to many times we see people riding a bike that just looks completely wrong, unfit for purpose, unsafe or just so uncomfortable that riding it would need some sort of physical therapy. will those bike riders return to that store or online dealer to get another bike. I wouldn’t. Exactly why my husband and I developed BikeBookings, to assist the local bike shop remain relevant in the E-Commerce era, it also helps non technical people like me make bookings for my bike service. We are all talking online vs physical store. What about supporting local store that doesn’t give you prices that everyone else around the area does? That is too like buying the item online in the eyes of that specific shop asking for a high/retail price+. I have found a shop in south east with an excessive knowledge (from what it sounded like) but the prices are always at a retail level. I’m referring directly to Berwick Cycles. A shop that is run by an ex-champion cyclist that doesn’t really have much of an idea about business unfortunately. When asked around the riders in the area, everyone told the same story – BC IS EXPENSIVE, MORE EXPENSIVE THAN EVERYONE ELSE. I live near Berwick, closer to Fountain Gate and I am looking for a reputable bike store. I have found one (Hampton Cycles), I want to support local (Berwick Cycles) but with price differences quoted – I just can’t get over the BC shop attitude with the high pricing. Local shops like that tend to push customers away rather than pulling them in for more business. I guess this is one of the reasons why the owners had to close Trailmix, due to lack of business/online sales/cheaper competitors offering THE SAME level of service. Not all local bike shops are perfect, but with time you will discover the better ones. One of our local shops is excessively enthusiastic about money, but the others seem to be in business because they like bikes. For many people, their local bike shop can provide mechanical assistance, useful advice, and a range of bikes from the expensive to the inexpensive. I bought a somewhat inexpensive bike from my LBS some years ago, and it was properly set up and adjusted and ready to ride. For the rider more knowledgeable in the use of spanners, especially if that rider is unable to prevent the slow accumulation of fruity old bikes in their fleet, a LBS can also provide a supply of obscure old spare parts, or a list of other bike shops or people who have obscure old spare parts. But how do you go wearing helmets? My head gets so hot that I get headaches, and start feeling woozy and generally impaired. I’ve been told that I am too fat and too fit. I am a moderate eater with a history of riding up big hills, so what can I do? Note that operating a vehicle (a bike, a car, a bus) on a public road when woozy and impaired is illegal, so I assume that makes wearing a bike helmet illegal.